Architect Ludwig O. Solberg was born in Minneapolis, Minnesota on November 2, 1886 and was raised in Spokane. He attended Washington State College (now Washington State University) from 1907-1908 and served in the Marine Corps during World War I. Solberg settled in Wenatchee around 1920 and received his architectural license from the State of Washington in December 1922. Upon his arrival in Wenatchee, Solberg took a job with the architectural firm of Morrison & Stimson and is listed along with them for the construction of the Chelan County Courthouse, completed in 1924. Solberg acted as manager of the project. Solberg later established his own practice and became the most prolific and prominent architect in the Wenatchee Valley, designing hundreds of structures in a variety of architectural styles from the 1920s to the mid-1950s. His commercial designs reflected popular styles of time including Beaux Arts, Tudor Revival, Spanish Colonial Revival, Art Deco, and Gothic Revival. 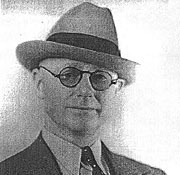 Some of the buildings credited to Solberg include the Wenatchee Fire Station (1929; listed on the national, state and local registers); the Wenatchee Police Station (1931); the Elks Temple (1922); the Warren Motor Building (1921); the First Federal Savings and Loan Building (1926); Chelan County Shop/Annex; Davis (now Hamilton) Warehouse (1920 & 1927); and numerous schools: (Wenatchee High School, H. B. Ellison Jr. High School, Columbia Elementary, Stevens School, Lincoln Elementary School, District 88 Building, and Lewis and Clark Elementary). Other projects include the Church of the Brethren (1928); a remodel of the exterior of the Wells and Wade Building; the first Salvation Army Building (1928); and former J.C. Penney's Building (1926, now Washington Mutual Building). Other buildings attributed to Solberg outside Wenatchee include Dryden Elementary; Bridgeport Elementary School; Chelan High School; the Chelan Ford Motor Co. Building; Chelan Masonic Temple; Cashmere City Hall; the Ludington Building; and the addition for the Douglas County Courthouse. Solberg also designed numerous apple packing warehouses in Cashmere, Chelan, Dryden, and Wenatchee including the Cascadian Fruit Storage in Wenatchee. He also held a patent on a "reversed air system" for warehouse fruit storage. In addition to commercial structures, Solberg also designed many prominent residences in Wenatchee such as the D. L. Woodruff House (124 S. Franklin); the McBride House at 918 Idaho (1928); the D.A. Shiner House (927 Idaho); the Wilder Jones House (1931); and the T.L. Ross House (1931). Solberg passed away on November 26, 1967 at the age of 80. His collection of drawings, photographs, and specifications and his drafting table were donated to the Wenatchee Valley Museum & Cultural Center in 1998. 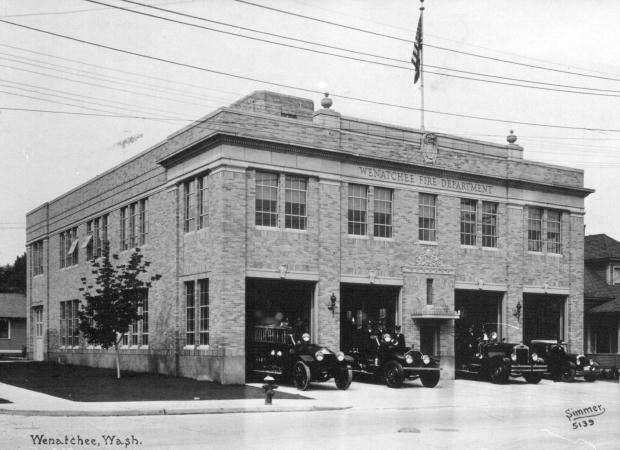 The 1929 Wenatchee Fire Station No. 1 is significant as a property that represents the development and growth of the City of Wenatchee’s Fire Department. The mid-1920s and early 1930’s was a period of rapid growth in the City of Wenatchee, especially in the downtown business core. Key individuals, investment groups and a booming agricultural industry, fueled the construction of many significant structures in the downtown core during this era. The construction of the fire station, completed by the Colonial Construction Co. of Spokane, is the first building designed and built solely for the purposes of the fire department. The building served as a critical service for the busines center, serving fire emergency needs in the downtown and the growing residential areas to the north, south and west of the city.